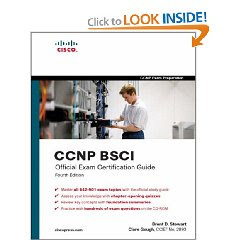 CCNP BSCI Official Exam Certification Guide, Fourth Edition, follows a logical organization of the CCNP® BSCI exam objectives. Material is presented in a concise manner, focusing on increasing readers’ retention and recall of exam topics. “Do I Know This Already?” quizzes open each chapter and allow you to determine how much time you need to spend on each section. Exam topic lists and Foundation Summary tables make referencing easy and give you a quick refresher whenever you need it. Scenario-based exercises help you think about exam objectives in real-world situations, thus increasing recall during exam time. Challenging chapter-ending review questions help you assess your knowledge and reinforce key concepts. 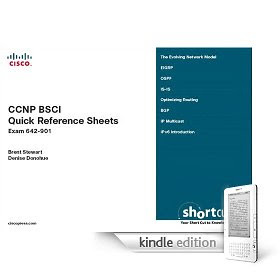 As a final exam preparation tool, the CCNP BSCI Quick Reference Sheets provide a concise review of all objectives on the new CCNP BSCI exam (642-901). This digital Short Cut provides you with detailed, graphical-based information, highlighting only the key topics in cram-style format. With this document as your guide, you will review topics on advanced IP addressing, routing principles, multicast routing, IPv6, manipulating routing updates, configuring basic BGP, and configuring EIGRP, OSPF, and IS-IS. These fact-filled Quick Reference Sheets allow you to get all-important information at a glance, helping you to focus your study on areas of weakness and to enhance memory retention of essential exam concepts. 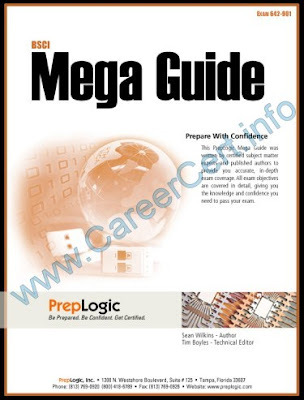 The Ultimate BSCI Study Guide brings you all the detail you need, in an easy-to-read format that is actually fun to read! 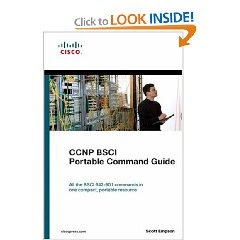 The BSCI exam is packed with difficult topics – BGP, complex OSPF scenarios, policy routing, route redistribution, route summarization – those are just some of the topics you will master when working with my BSCI Study Guide. –Many candidates think they’ve passed the BSCI exam, hit the score button, and find out they failed. You will avoid this fate and pass the exam where others fail after reading this special report. This special report is packed with “gotchas” that can cost you valuable exam points – and you will avoid these costly mistakes on exam day. –You’ll learn how to create a VLSM scheme according to any network requirements given you on the BSCI exam or on the job with this special bonus item. My BSCI Study Guide shows you how to create the scheme, and this special ebook gives you additional practice – plus a foolproof and fun method of getting all the practice you need in order to excel on the exam! Answering VLSM questions on the BSCI exam and on the job will hold NO fear for you once you work with the Ultimate BSCI Study Package! The Ultimate BSCI Lab Workbook is packed with fully illustrated labs for your exam success. I’m telling you from experience that the only way to master these protocols is to really work with them. Working with “router simulators” is just not the same. But you also need a guide on what to work on with your rack time, and that’s what my Ultimate BSCI Lab Workbook is all about. Hi there, I would like to write the BSCI 642-901 exam on next week, please let me know which is the latest version in this? If anyone of people have the latest version of BSCI 642-901, pls share the same. thanx for this quicker mate. no more query at the moment but if u find some solution for it let me know mate i m also working on it. cheers mate. Hi dear, I have tried these p4s setups on both VMware guest, host machine and virtual PC too. They just runs fine without any CPU usage. I don't know why people experience 100% CPU! If you don't have any registered or important software on your host machine you can install these p4s crack setups without worry. Let me know any further question. hi there bro ? i just want to know that if i install p4s exes on a host machine will it still use 100 % CPU or its just for vm ware guest machines ? please let me know because i have never tried this because of lack of time. thanx mate. and thanx for new posts as well. Thanks alot for posting the material needed to clear the BSCI….appreciated.. Thanks a lot for Great help. The Bryant 4shared links has been added. OK i am uploading. Links will be available within few hours. Please can you provide the link from 4shared for "The Bryant Advantage Ultimate BSCI Lab Workbook & Command Reference-"
and lots of hands on practice. Thannks for posting all these books now i am preparing from your recommended trainigs and books for bsci paper for which i would appear in july.